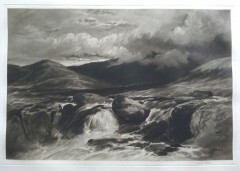 Frank Short, painter and engraver of fine etchings and mezzotints, was born in Stourbridge, Worcestershire. Short abandoned his early career as an engineer for art, which he studied at South Kensington and Westminster School of Art. He won gold medals for engraving at the Paris Salon in 1889 and 1900. In 1891 he was appointed Director of Engraving at the Royal College of Art; later becoming Professor in 1913.Short became Treasurer of the Royal Academy (1919-32) as well as Master of the Art Workers Guild. He was knighted in 1911 for his services. Short retired from the Royal College in 1924. He succeeded Sir Francis Haden and became President of the Royal Society of Etchers in 1910 to 1938. He had a seminal influence on British print making and might be considered the father of the British etching Boom, for he taught many of the next two generations of printmakers writing extensive books on the method of etching, engraving and mezzotints. Short is also well known for reviving mezzotint engraving in Britain as an original creative medium. 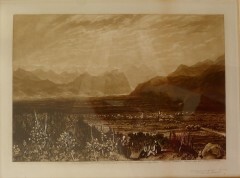 At Ruskin’s suggestion, Short embarked on completing Turner’s Liber Studiorum. He later adapted the medium to contemporary country and urban landscape scenes, exploiting its tonal qualities. Royal Society of British Painters-Etchers.